On June 30, 1960, slightly over 50 years ago, the largest African colony Congo became independent of Belgium. 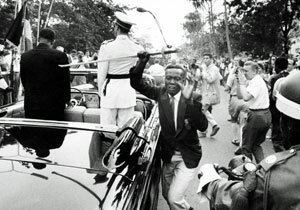 The day before, Wednesday, June 29th, around half past four in the afternoon, as the Belgian King Baudouin was being driven through Kinshasa, standing bolt upright next to the future president Kasavubu in a Cadillac convertible, he saluted the Belgian flag. At this very moment a young Congolese man steps from the crowd, steals the sabre of King Badouin from behind, and runs away. And photographer Robert Lebeck eternalizes the incident in a single shot. In BOYAMBA BELGIQUE: OR WHY A KING SHOULD NOT LOSE HIS SWORD, this picture becomes a keyhole through which to peer at the decolonization of Africa. For the filmmakers embark on a search for the thief, meeting eyewitnesses, searching for archives, visiting villages, and digging into the meaning and symbolism of the act. Until most good stories of hidden history, after false starts and misdirection about the person and meanings both, they do discover the real thief, and, why he did it.